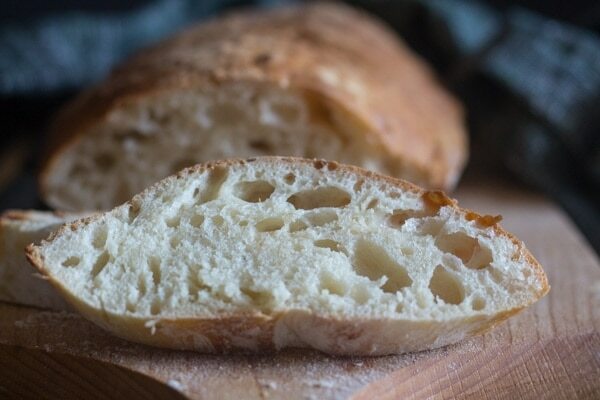 This is an Easy no Knead, One bowl Italian Ciabatta Bread. 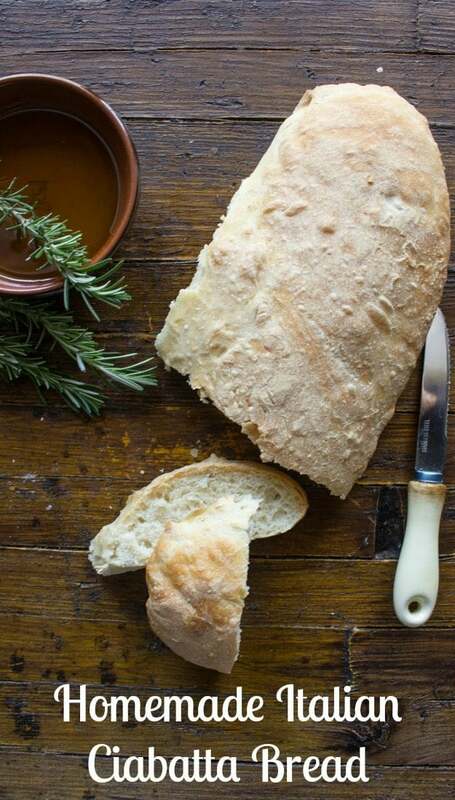 Two hours and you can have Homemade Bread for lunch or dinner. Makes the perfect Sandwich too! 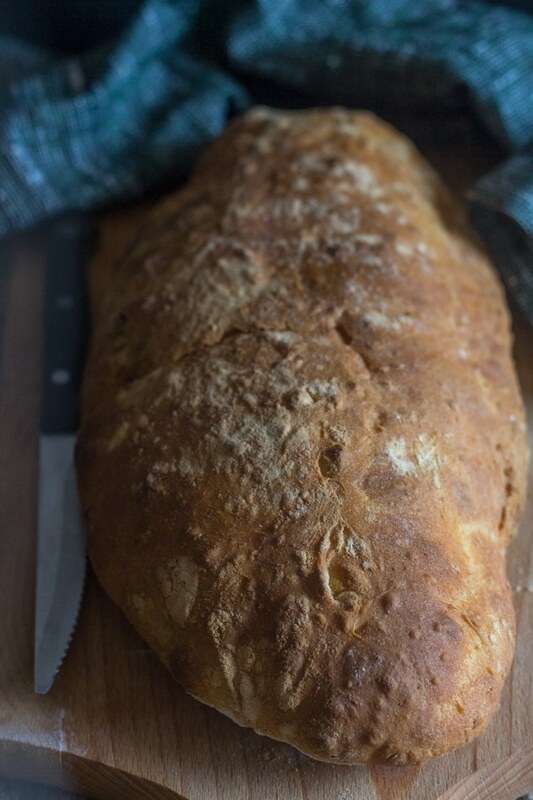 I never really grew up around fresh baked bread. My mother was an amazing sweet baker and a great cook but not a bread maker. But then I moved to Italy, and of course bread is a serious business here. Whether it be the local bakery or Homemade. 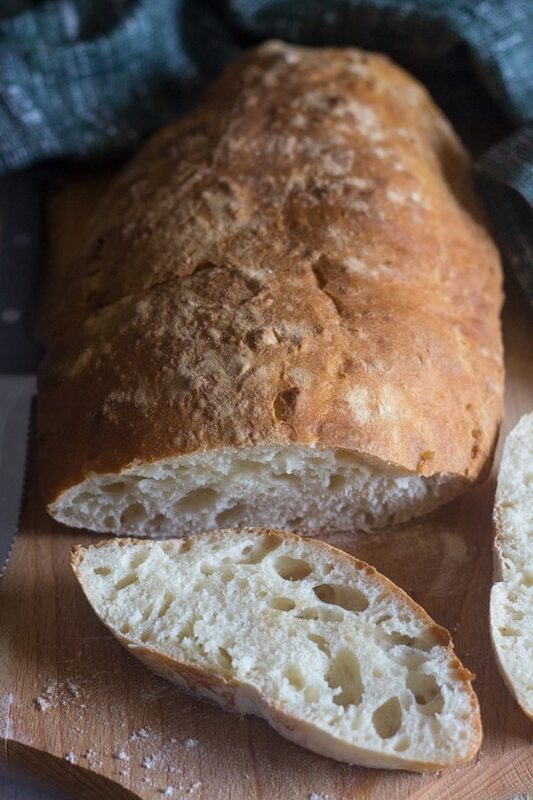 The Italian’s mother made all their bread when they were growing up. All the ingredients to be mixed. All the ingredients mixed, flour sprinkled on top ready to rise. And then not so much after, so it became a wonderful treat when she did make it. 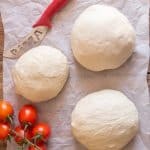 From Homemade Italian Ciabatta Bread to Focaccia to Pizza. 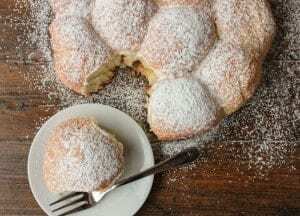 And when she took pieces of dough, formed it into a round circle and then fried it and when it warm sprinkled it with a little sugar, now that was a treat and ..
We couldn’t wait to get our hands on it! Ciabatta bread dough after rising for 1 1/2 hours. Ciabatta Bread loaf ready for baking. In a small bowl add 1/4 cup water, honey and yeast, let sit for 5 minutes, then stir. In a large bowl add the flour. 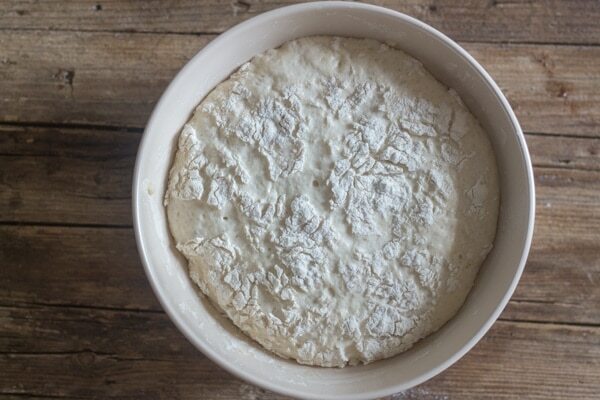 Make a well in the centre and add the yeast mixture and the remaining water. Mix with a wooden spoon, add the salt mix again. The dough will be loose and sticky. 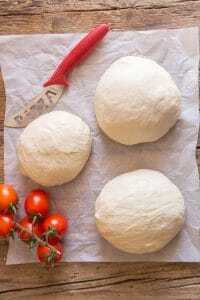 Sprinkle a little flour on top of the dough, cover the bowl and let the dough rise in a draft free area for 1 1/2 hours. Lightly flour a parchment paper lined cookie sheet. Gently move the dough from the bowl to the prepared cookie sheet, making sure the top of the dough (the floured part) remains on top. 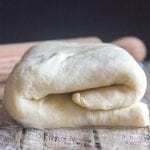 With a spatula form the dough into an oblong shape and bake for approximately 20-30 minutes. Let cool and slice. then using a thermometer is your best best, the bread is baked when the centre of the loaf registers 200 to 210 degrees. 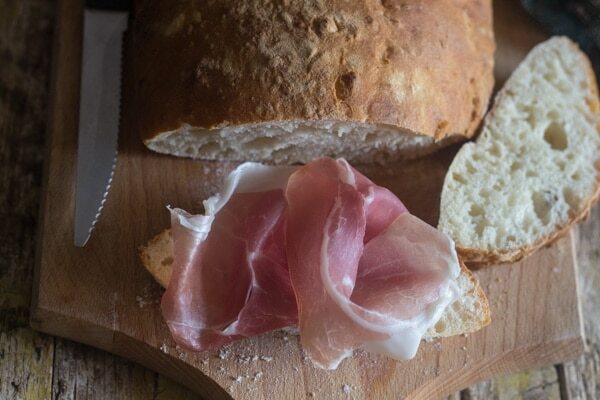 This bread is originally from the North of Italy, from the Province of Rovigo in Veneto Region. It is a flat, elongated bread with a light texture. It is a very simple bread, made up of a very high quantity of water. It produces a very large crumb. 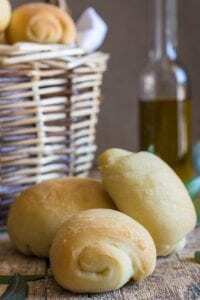 And is considered a typical old fashioned Italian bread. More Delicious Yeast Breads you may Enjoy! 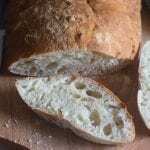 Why I became intrigued with bread making I have know idea, it started in my early twenties and went from there. I would try making something now and then from Bagels to Pizza and the occasional Loaf of Bread. This Bread is just that and delicious too. The perfect sandwich or dipping bread! I hope you enjoy it! 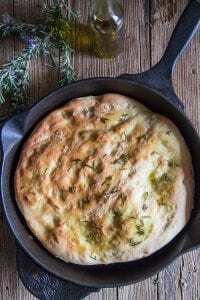 Homemade Italian Ciabatta Bread, an easy Italian Bread Recipe, perfect for dipping or using as an appetizer. Delicious. In a small bowl 1/4 cup of water, honey and yeast, let sit 5 minutes then stir. 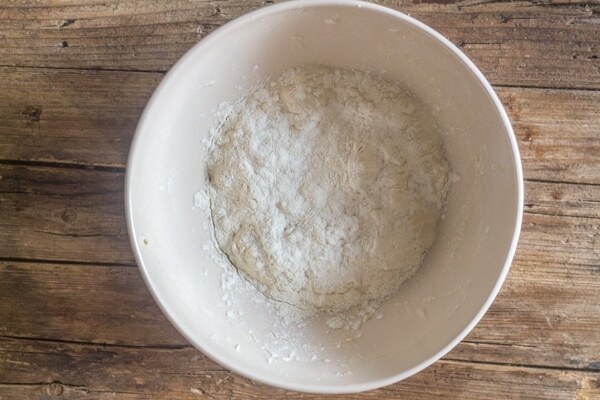 In a large bowl add the flour , make a well in the centre and add the yeast mixture and remaining water. 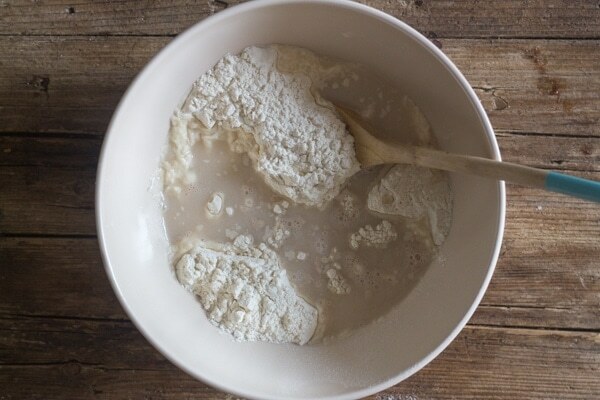 Mix together with a wood spoon, when almost mixed add the salt and combine. The dough will be loose and sticky. Sprinkle the top with 1 1/2 tablespoons of flour. Cover the bowl with a large tea towel, place in a warm, draft free area and let rise for 1 1/2 hours. Pre-heat oven to 425F (220C), line a cookie sheet with parchment paper and sprinkle with 1 1/2 tablespoons of flour. Carefully move the dough from the bowl to the prepared cookie sheet, making sure that the floured top of the dough remains on the top. With a spatula form the dough into an oblong loaf, place 5 or 6 ice cubes on a pan on the bottom of the oven to create vapor. Bake for approximately 20 - 25 minutes. Let cool and serve. Enjoy! Love your recipe. It was simple and easy. Added parmesan and my kids loved it. Will definitely make again. Thank you for sharing. Hi Rose, thanks so much, so glad everyone enjoyed it. Good idea with the addition of Parmesan cheese. Have a wonderful Sunday. I made this and came out absolutely amazing. My family thought it was store bought. 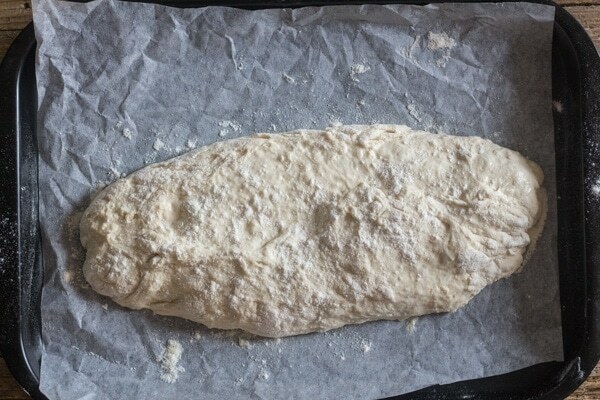 I have a couple question….can I use whole wheat flour and when the dough rises can I cut it into smaller pieces like sandwich bun size and then cook it? 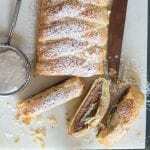 First time I made it exactly how your recipe called and came out perfect but I would like to try a different way also. Thank you for your wonderful recipes. Hi Janet, thanks so glad you all liked it and the recipes. And yes you can use whole wheat flour although you should reduce it from 1 cup of all purpose to 3/4 cup whole wheat (because whole flour is denser), and sure you could make buns, that’s a good idea. Have a great weekend. Hi Annalisa, thanks, I took a look, looks great, so glad you liked it! Hi Debby, thanks yes that is what usually happens to the bread. I make it so often now I don’t bother with the ice cubes anymore. So glad you liked it. 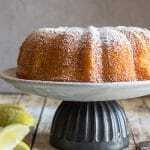 Can you use whole wheat flour? Or 1/2 wheat, 1/2 regular flour? Hi Valerie if you do you should add less whole wheat the all purpose (for example 3/4 cup whole wheat for 1 cup all purpose), because whole wheat is heavier it produces a denser dough, so less is better. So yes maybe try with 1 cup all purpose and 3/4 cup whole wheat and see how that goes. Hope that helps. Hi Monica, yes it definitely shouldn’t be liquidy, The dough will spread a little but to a certain point and then it will hold it’s shape. Let me know how it goes. Good Morning, Can I use Bread Flour instead of all purpose?? Hi Maria, yes I’m sure that would work. Hope you like it. Have a great weekend. Awww. Sweet post!! THANK YOU so much. This is going to be a great adventure! Hi Karen, thanks and it sure is! Looking forward to it. I love making ciabatta!! Frankly, I never know how it’s going to turn out but the smell is phenomenal. Sometimes working with such a wet dough is a challenge but we love getting our hands into it 🙂 Great photos!! Hahaha Marisa yes we do! It is a delicious bread. From one Italian to another–delizioso!